1954, the height of the Algerian War. While the occupying French forces struggle to maintain control of the capital city, Algiers, Arab insurgents use guerrilla tactics to try to overthrow the French. Employing many of the techniques of Italian neo-realism, Gillo Pontecorvo’s stunning documentary-style features remains as starkly relevant now as ever. In the opening sequence of The Battle of Algiers, an old man has been tortured by the authorities to reveal the location of what we are told are fellow insurgents. Reluctantly he leads the soldiers to house wherein are hidden behind a false wall three men, a woman and a boy. Though context tells us that the people hiding are guerrilla fighters, the imagery is unmistakably reminiscent of the holocaust, the presence of an unarmed woman and a child making the soldiers’ threats to blow up the house all the more chilling. 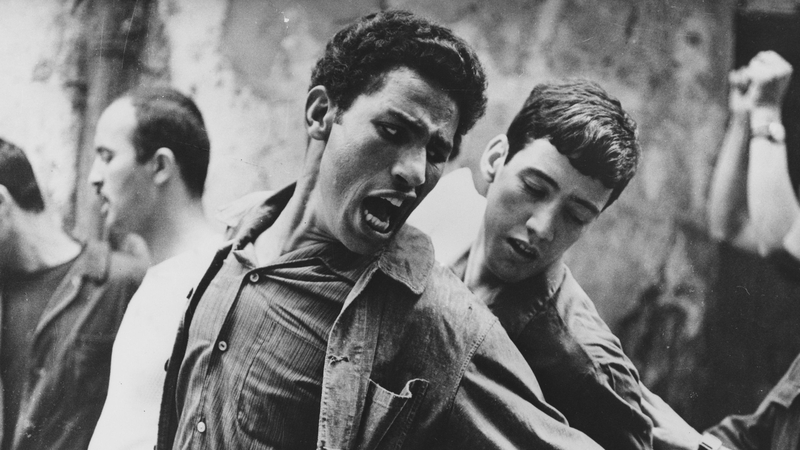 Indeed, the shifting contexts of The Battle of Algiers is perhaps key to understanding both the film itself and the multi-variant ways of reading its meaning. Pontecorvo’s grainy black and white cinematography, often handheld, invariably suggests a documentary realism, but is set against the broad cinematic texture of Ennio Morricone’s muscular score (tellingly recycled by Quentin Tarantino in his a-historically hyperreal Inglorious Basterds). Moreover, Pontecorvo’s favouring of montage over linear narrative not only hearkens back to revolutionary Soviet cinema, but also creates a chaotic world where events do not have causative sense, where terrorist bombings, border checks, oppression, and state-sanctioned violence cannot be formed into a neat story with a beginning and middle with a neat resolution at the end. The 1966 film’s political aesthetics have not only endured, but in the age of fake news, seemingly endless Western intervention in the Middle East and global suicide bombings, they are more relevant than ever. But what is perhaps most surprising about The Battle of Algiers is its refusal to proselytise, neither martyring its insurgents nor heroising its soldiers. Embodying both causes are Ali La Pointe (Brahim Hadjadj) as a leader of the insurgent FLN, and Colonel Mathieu (Jean Martin). Both men are utterly convinced in the righteous of their actions, and both it could be argued, are not naturally violent, yet are driven to violence by their immovable sense of righteousness. Yet neither of them are depicted as zealots. Ali is a freedom fighter by any other name yet his group commit atrocities against innocent people, whereas Mathieu, a former fighter in the French resistance, simply wants to keep the peace, but is quite prepared to torture citizens and commit atrocities of his own to do so. In presenting impossible problems without easy answers, The Battle of Algiers is surely among the finest depictions of modern colonialism in cinema, its historical and political force no less severe today.